Inspired by the folding techniques of Ron Reush, “a visionary mathematician and designer who was one of the first to explore the architectural potential of 3D tessellated structures in the 1960’s and 70’s,” Hans Sachs at Responsive Design Studio created the Durian. Durian is a 3D-folded bowl made from white Dibond aluminum composite material. Because of the product’s composition of the thin aluminum with a solid polyethylene core, along with the technicality of the folding, the bowl is incredibly rigid and lightweight. The product is self-assembled which reduced shipping and energy costs, as it arrives to the consumer home as a 37×37 cm plane sheet. 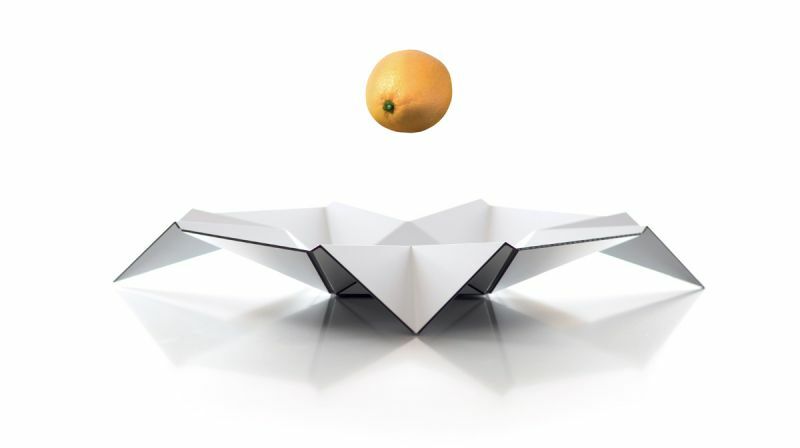 The fold-it-yourself idea allows the consumer to customize the final shape, and degree of folding, of the product. Dibond aluminum composite material can be accurately folded by hand after a simple routing operation is done on the back skin. It is unique to metal composite panel fabrication. Self-assembly is easily done with the company’s instructional video.